When the call went out for help with the Opening Ceremony Color Guard at the American Chamber of Commerce’s Independence Day Ceremony in Bangkok, the Young Marines of Pattaya responded. Three of the four Color Guard members were from the Young Marines Unit. The Young Marines were at the American 4th of July Ceremony (ID4) to assist the Special Forces Association Chapter III (SFA III) with their booth operation and sales. When the request for help went out, Young Marines PFC Bret Mays, Adult Leader Jim Coomes and Unit Commander Rad Mays responded. Adult Leader Nok Mays remained at the booth and maintained sales operations. 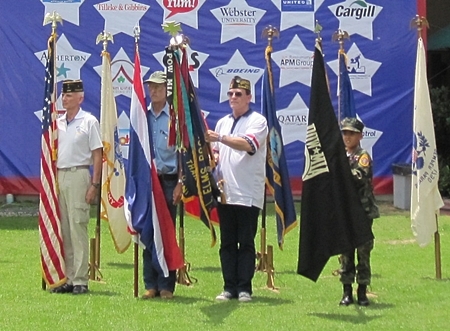 Color Guard at present arms during ID4’s opening ceremony in Bangkok. Left to Right: Rad Mays, Jim Coomes, Rick Reece and Young Marines PFC Bret Mays. 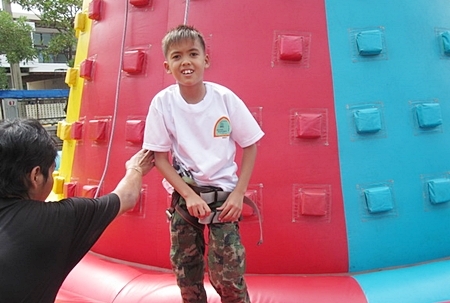 After the Opening Ceremony the Young Marines Unit members returned to assisting at the SFA III’s booth. But, they all did get to enjoy the many foods, attractions and activities through out the rest of the day. 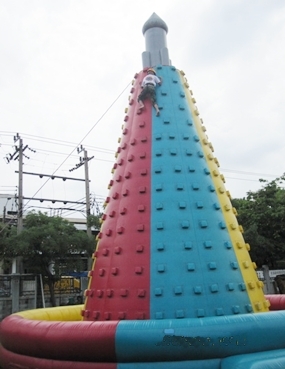 PFC Bret Mays on a climb at ID4 in Bangkok. PFC Bret Mays being rigged for climb at ID4. 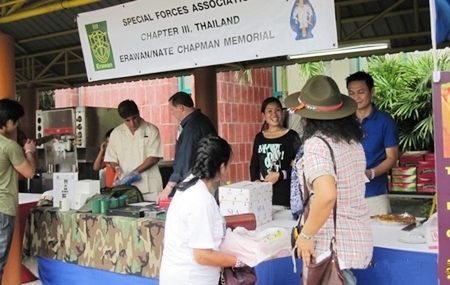 Young Marines Adult Leader Nok Mays sells apple pies in Special Forces Association Chapter III’s booth at ID4 in Bangkok. Buy an apple pie and get free ice cream on it from the next booth.